DocuClock can be configured to print time stamps, messages, static messages (labels), as well as text that is saved only to a log file. All the fields can be configured independently and all are fields are optional. Message fields contain text that will be printed on the slip. The message field can be also be changed at any time from the field in the middle of the main screen. For instance, 200 Shares of CSCO. Label fields print a static message on each slip. Examples of label fields include personal or company name. Blank fields remain blank when printed  effectively skipping a line on the slip. No print fields are skipped over during the printing of the slip. Unlike the blank fields they do not produce an empty line. Log fields are used to save a special text message to the log file. The log fields are not printed on the slip but are written to the log file. See the logging option section below. Serial number fields will print a unique sequential serial number on each document. You can specify the starting number and select a variety of formatting options for the printed output. (0) Digit placeholder. Display a digit or a zero. If the expression has a digit in the position where the 0 appears in the format string, display it; otherwise, display a zero in that position. If the number has fewer digits than there are zeros (on either side of the decimal) in the format expression, it displays leading or trailing zeros. (#) Digit placeholder. Display a digit or nothing. If the expression has a digit in the position where the # appears in the format string, display it; otherwise, display nothing in that position. This symbol works like the 0 digit placeholder, except that leading and trailing zeros aren't displayed if the number has the same or fewer digits than there are # characters. (,) Thousand separator. The thousand separator separates thousands from hundreds within a number that has four or more places to the left of the decimal separator. Standard use of the thousand separator is specified if the format contains a thousand separator surrounded by digit placeholders (0 or #). ("ABC") Literals. Display the string inside the double quotation marks (" "). Time fields allow the printing of a time stamp in a user-defined format. By modifying the format you can easily customize the time string that is both printed on the slip and shown in the time window. Using the time format options you can pinpoint when a event occurred with millisecond resolution. d Displays the day as a number without a leading zero (1 - 31). dd Displays the day as a number with a leading zero (01 - 31). ddd Displays the day as an abbreviation (Sun - Sat). h Displays the hour as a number without leading zeros (0 - 23). hh Displays the hour as a number with leading zeros (00 - 23). m Displays the month as a number without a leading zero (1 - 12). If m immediately follows h or hh, the minute rather than the month is displayed. mm Displays the month as a number with a leading zero (01 - 12). If m immediately follows h or hh, the minute rather than the month is displayed. mmm Displays the month as an abbreviation (Jan - Dec). mmmm Displays the month as a full month name (January - December). N Displays the minute as a number without leading zeros (0 - 59). nn Displays the minute as a number with leading zeros (00 - 59). y Displays the day of the year as a number (1 - 366). yy Displays the year as a 2-digit number (00 - 99). yyyy Displays the year as a 4-digit number (100 - 9999). S Displays the second as a number without leading zeros (0 - 59). ss Displays the second as a number with leading zeros (00 - 59). ss.s Displays the second as a decimal number with leading zeros (00.0). ss.ss Displays the second as a decimal number with leading zeros (00.00). \ Is an 'escape' character used to indicate the next character should be treated as a literal. It is used to embed literal strings using reserved characters within time strings. AM/PM Uses the 12-hour clock and display an uppercase AM with any hour before noon; display an uppercase PM with any hour between noon and 11:59 P.M.
am/pm Uses the 12-hour clock and display a lowercase AM with any hour before noon; display a lowercase PM with any hour between noon and 11:59 P.M.
A/P Uses the 12-hour clock and display an uppercase A with any hour before noon; display an uppercase P with any hour between noon and 11:59 P.M.
a/p Uses the 12-hour clock and display a lowercase A with any hour before noon; display a lowercase P with any hour between noon and 11:59 P.M.
AMPM Uses the 12-hour clock and display the AM string literal as defined by your system with any hour before noon; display the PM string literal as defined by your system with any hour between noon and 11:59 P.M.
displayed matches the string as defined by your system settings. The default format is AM/PM. DocuClock also has the ability to print a date or time different from the current time. You enable this by setting the time difference from current time (set the Time Offset option in Options->Display). You can then print the time or date a day, week, month or year in the future. The printer options in DocuClock allow you to change the appearance of the printed output. DocuClock offers settings for the font size, font type, format and printing options. Choose from 2 different sized fonts and 4 different font spacings to size your output. Sets an approximate top margin (in inches) from where printing starts. Sets an approximate left margin in inches measured from the left edge of the paper. When used, automatically feeds slip out of printer after printing. DocuClock features several useful indicators on both the DocuClock printer and on the computer screen that let you know when DocuClock is ready to print. Connect  shows if that the connection to the printer is established ant that the printer is healthy. Off-line  shows that the printer is off or has a problem. When in the manual auto sense mode, commands the printer to print a time stamp. Automatic  Print the time stamp whenever a slip is introduced to the printer. No keys need be pressed on the computers keyboard. Manual  print on slip after pressing the button on the screen when there is a slip in the printer. DocuClock can show the real time in taskbar when the DocuClock application is minimized. DocuClock continues to update the time every second. This light is on whenever power is supplied to the printer. This light is on when the printer is in the paper release mode and it is off when the printer is in the clamp mode printing the slip. This red light is on when paper is not inserted or is not inserted correctly. The paper is considered inserted when in view of the optical sensors located in the print head. Otherwise the printer releases the slip after printing. The log file shows information about time stamps printed. Logging is useful for keeping a computer record of when a slip was printed or when an event occurred. The user can turn logging on or off and select which log file to write to. Once a log file is specified DocuClock will add data to the log file each time a time stamp is made. The log file will record the time the stamp was made, and include any message and log fields selected. The log fields are only printed in the log file. 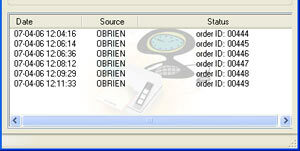 Timestamps can be printed in the file giving a precise record on when the time stamp was made. This can be done with millisecond precision using the msec time format options. DocuClock has the option to write to a log file every time a time stamp is made. The log file is a text file that can be located locally on the computer or on another computer on the network. The Action Log is a summary view of all current time stamping activity. Data are displayed in a list on the main screen and are added as they occur. Entries include the origination of the action and the result. Upon starting, the list shows the five most recent events (if available). After the program closes, the action detail can be found in the individual time stamp logs. Date: Identifying source icon and date and time in yy-mm-dd hh:nn:ss format. Source: the printer making the stamp. DocuClock allows you to record precisely when an event occurs. Users have the ability to print an event time and/or write the event record to a file. When running on a computer that has its time standardized with ClockWatch software, DocuClock can provide either a hard copy or a computer record of when an event occurred with millisecond precision. To time the event the user simply presses the "Time Stamp" button on the computer screen or enters a paper slip in the printer to mark the time. The log file will record the time the event occurred, and include desired annotations. The timestamp can be made with millisecond precision using the msec time format options in DocuClock. Paper and file timestamps create a permanent record on when the event occurred. Also available is a separate Trigger Module that can use an external electrical signal to log an event. A Service is a Windows-specific system function that runs in a special area under Windows NT, 2000, XP or 2003. DocuClock contains a special module, which can be installed as a Service under these versions of Windows. This allows DocuClock to run in the special service area of the Windows operating system. Whenever Windows is running, the service is active and DocuClock is available. The DocuClock software development kit allows you develop a custom application and integrate DocuClock functionality with ease. A simple high level application programming interface allows access to the most common DocuClock functions such as stamping, changing messages, checking status, etc. The API communicates with the DocuClock service through the Windows Service Control Manager. The software development kit includes a working sample application and documentation. Heartbeat – tells whether DocuClock service is running. Status – reports on DocuClock printer status, On-line, Off-line. Printer Health Check – runs a simple printer health check. Stamp – prints slip using the current settings. Options Changed – indicates that the DocuClock settings have been changed and that the service should reset the new settings. Reset – reset the printer. Message - dynamically change the message that is printed out on each page. Note: In practice, you can change all types of DocuClock output lines programmatically. In addition to the message type, these types include logged messages, images, time format, and labels. The type of line (Message, Time, Image, etc) is normally set by the DocuClock application interface (Options->Page Setup). Be advised that the format for these lines is implicitly set for each type and no format checking is done by the function or the service. For more information, consult the DocuClock User’s Guide. The DocuClock software must first be installed on the target machine. No additional software is required to run the API. Verify that the DocuClock application works before testing the custom application. Use the DocuClock application interface for initial configuration and setup of the DocuClock printer and printed output. The DocuClock service should be set to run automatically from the Service Manager. This ensures that the DocuClock service is started at boot time. The DocuClock application does not need to be running to use the SDK. Form more information, contact Beagle Software. Copyright © 2008 Beagle Software. All rights reserved.